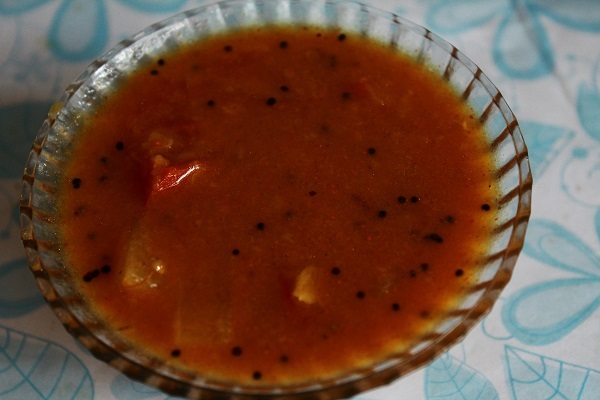 Today I am sharing the recipe of sambar. Though the name sambar looks very simple, but for the same word, there are various methods of preparation. Tamilnadu sambar is different from Kerala sambar and if you think about Kerala sambar, Palakkadan sambar is very different from Travancore sambar . Though I love palakkadan sambar with the taste of roasted coconut and other whole spices, I also like travancore sambar and also it is very easy to prepare. But in my personal experience, I would say, sambar made with fresh roasted spices tastes very different from that made with sambar powder. But in this recipe, I have made use of sambar powder. 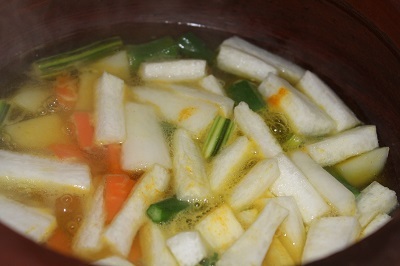 Usually sambar is prepared with radish, pumpkin, drumstick, carrot, potatoes, tomatoes, brinjal, lady’s finger and so on. 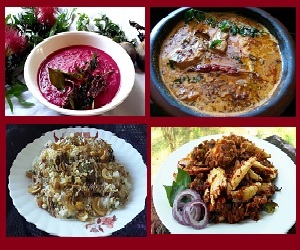 Sambar can be prepared exclusively with any of these vegetables or with a combination of vegetables. This recipe which I have shared here, makes use of mixed vegetables. 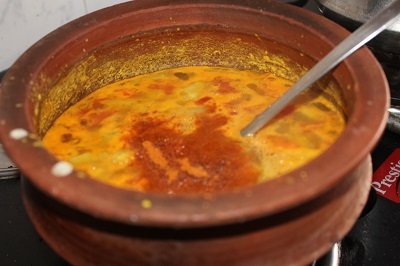 The method of preparing travancore sambar is very easy. Cook the dal separately, then mix and cook with all the vegetables and tomatoes. Once vegetables are cooked, add tamarind paste and sambar. Mix and boil it nicely. Then temper, sambar ready. 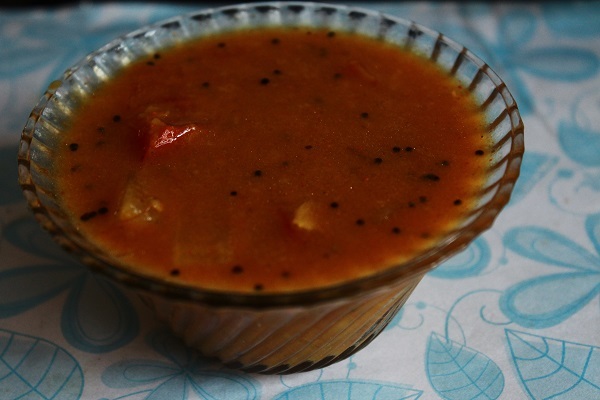 Easy and tasty sambar ready. Serve it with rice and thoran or mezhukkupuratti. 1. 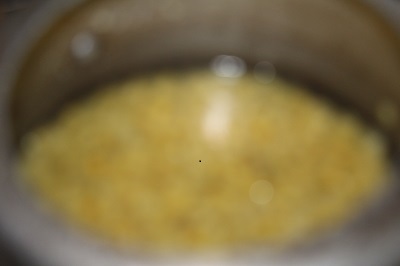 Clean and wash toor dal, transfer it to a pressure cooker and pressure cook for 3 – 4 whistles. Wait till the pressure subsides. Then open the lid and mash it nicely. 2. To make tamarind paste, take tamarind, wash it in clean water, and soak it in warm water for 30 minutes. You will find that the tamarind gets soft. Then squeeze it nicely, and remove the pulp. You can strain it to remove the bigger pieces of tamarind. Keep it aside. 3. Transfer the cooked dal to a bowl, add cut vegetables, tomatoes and salt to it. Add 3 cups of water and mix well. Bring it to boil, then cook on medium flame till the vegetables get cooked well. 5. Next add sambar powder and asafoetida powder. Mix well and boil for another 5 – 6 minutes. Check for salt. If necessary add more. Turn off the flame. 6. 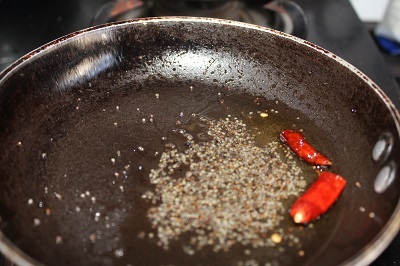 In another pan, heat coconut oil, splutter mustard seeds. Then add dry red chilly, curry leaves and chopped shallots and saute till onion turn brownish in color. Turn off the stove and add the tempering to the curry. If you find this post useful, I would be happy if you can share it with your friends in google+, facebook or twitter. All you have to do is click the corresponding button given.